Continuous improvement, or continual improvement, is the ongoing improvement of products, services or processes through incremental and breakthrough improvements.1 What do Lean, Six-Sigma, Total Quality Management, Performance Management and other sustainable management systems all have in common? Continuous Improvement. An effective ergonomics process also requires a continuous improvement framework. This breaks down barriers to quality, productivity, safety, and human performance. Fitting equipment, technology, tasks, and environments to the physical, mental and social abilities of people are at the core of ergonomics engineering, and a bad fit is often at the root of production failures. Continuous Improvement requires thoughtful planning, implementation, follow-up study (checking) — and often plan revisions and more follow-up study — before implementing (Acting). It’s a widely accepted and expected scientific approach to learning and applying value-adding knowledge in business processes. It’s always best to infuse ergonomics into the design and development of new equipment, workstations and processes from the start. This requires ergonomics design principles and guidelines be available, understood and respected by decision makers. Organizations with a mature ergonomics processes already know and do this. If ergonomics is new or misunderstood, an effective champion may help. Champions can be from management, an internal resource, or a respected 3rd party. Champions must work within the constraints and metrics that drive decision-making and prove the value of ergonomics-related decisions. If ergonomics wasn’t considered during the production Planning and Doing stages, the problems that inevitably result will show up only after the process is implemented. Start by Checking, better known in ergonomics as performing Assessments. In reactive situations, it’s usually injuries that trigger an assessment. 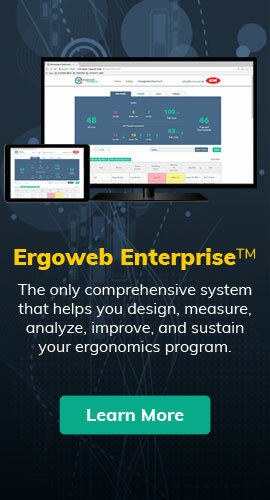 Once your ergonomics process matures, other metrics like production bottlenecks or errors will trigger an ergonomics assessment, since a mismatch between human capabilities and work processes is often the real root cause of production failures. Sometimes, the problem is so severe, or a solution so obvious, we can skip a detailed Check-Plan-Do-Act and go straight to implementation, quickly creating a breakthrough or incremental improvement. Be careful, however, to make sure the root cause of any problem is understood before applying solutions (see the example, below). You’ll know best, but here are a few ideas. A large multinational manufacturer experienced problems on a production line involving seated workers. Productivity goals were not being met, errors were being made, and workers complained of significant discomfort. Management noticed that the chairs did not have backrests, and observed most employees bent and leaning forward while they worked. With good intentions, they purchased hundreds of new chairs with backrests, assuming employees would use them if available. However, after significant expense and disruption, none of the employees used the backrests on the new chairs, and the production failures persisted. But why? A simple Plan-Do-Check-Act process would have quickly uncovered that the root cause of the posture problems was not the chairs, it was the location and orientation of the work relative to the seated workers. The workers could not adequately reach and see their required work steps while leaning back against a backrest, so the backrests on the new chairs served no useful purpose. The root cause of the problem was the design of the workstation, not the original chairs. By treating the symptom rather than the root cause, management wasted significant time and resources. Production barriers caused or worsened by a poor match between people and process are prevalent in any company that ignores ergonomics engineering. 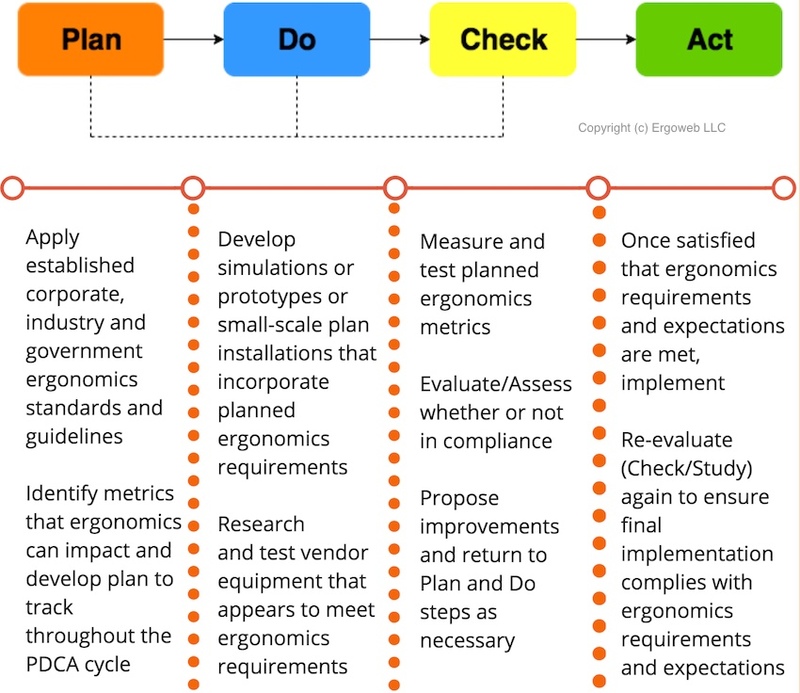 A sustainable ergonomics process must be built upon a continuous improvement workflow. Doing so will improve productivity, quality and waste-related production metrics and improve key performance indicators (KPIs) in EHS and HR. A well formulated ergonomics process is a rare win-win opportunity for companies that are built to last.